Approximately 80% of school-based learning is accomplished visually. Yet interestingly, in spite of this well-known correlation between vision and learning, a lot of people don't realize how profoundly vision problems affect education, and as a result, don't get their child's eyes examined regularly. 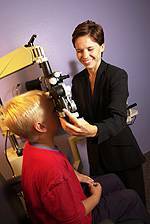 As your kid's vision may change frequently, regular eye exams are necessary for success at school. It is even more important to monitor the signs of vision problems as your child progresses in school. Warning signs may include trouble seeing numbers or letters, frequently watering eyes, eye rubbing, extra close reading distance, head tilting, and avoiding detailed work. Impaired eyesight and increasing visual demands such as homework and small print in textbooks can impact his or her performance. New classroom technology, like interactive whiteboards, can sometimes exacerbate subtle but significant vision problems. Without adequate vision, students may suffer not only in the classroom, but also mentally, physically and emotionally. If your child has already been tested for and fitted with glasses, now is a good time to see if their current frames are right for them. If children don't feel comfortable in their glasses, they will probably avoid wearing them. So be sure to make an appointment to see us when you're getting your children all ready for their year. We'll do our very best to help your child start the academic year with great vision.